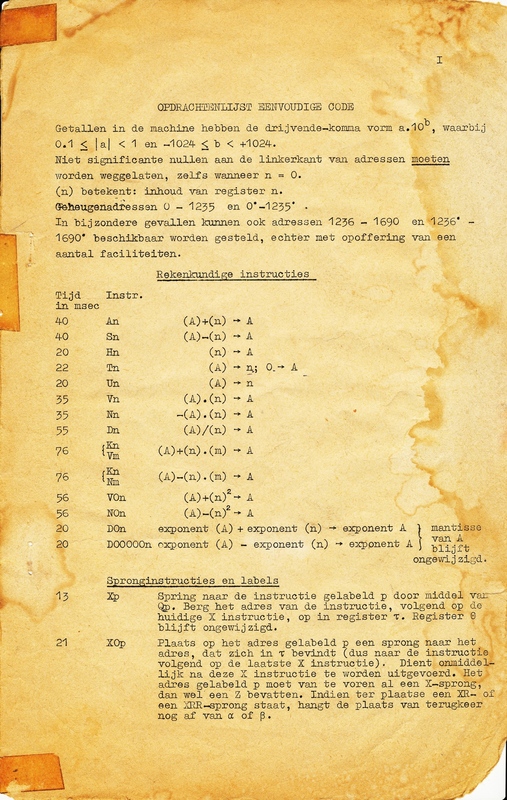 ... or in English "Very Simple Binary Computing Automaton", was one of the first Dutch computers. It was built by Prof. W. van der Poel at the Dr. Neher Laboratory in Leidschendam, and used microcode technology, which made it hard to program. Although the ZEBRA microcode level was directly accessible, there was also an assembler which implemented "Simple Code", and which presented a fairly conventional machine to the user, with an instruction store, a data store, and 7 special-purpose registers. The ZEBRA microcode is described in Chapter 12 of C. Gordon Bell's "Computer Structures -- Readings and Examples" (pages 220, 221, 222, 223, and 224). The ZEBRA Simple Code is described in a paper by van der Poel, "The Simple Code for ZEBRA", Het PTT-Bedrijf, Vol. IX, 2, Aug. 1959, pg. 31-64. Around 1960 I read a course on Crystallography at the Rijksuniversiteit Utrecht as part of my Physics study, and was told that the required computations were performed on the ZEBRA. I wanted to see and program the machine but could not get access to it. Some years later, when the ZEBRA had been replaced by the Electrologica X1, I managed to dig up a ZEBRA Simple Code manual (in Dutch). It was in deplorable state (original first page), and I am unclear about its status. It may have come with the machine or it may just be a summary of the Simple Code instructions for local use.